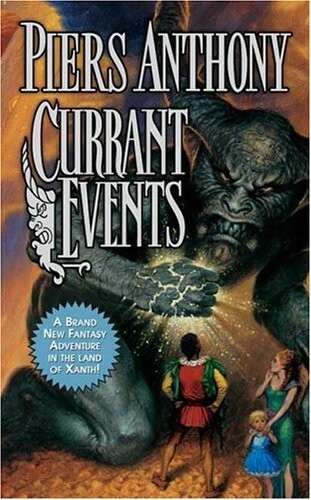 When Clio, the Muse of History, sat down to pen the twenty-eighth volume in the Chronicles of Xanth, she was stunned to discover it was already there! And, what was worse, it was totally unreadable, for the words on its pages were fuzzed beyond comprehension.Vexed and bewildered, and more than a little concerned, Clio resolved to leave the quiet comfort of her study on the slopes of Mount Parnassus, and ask her old friend, the Good Magician Humfrey, to search a solution to her problem in his Book of Answers.But, much to her consternation, Humfrey required her to perform a magical Service before she could acquire her Answer: to rescue Xanth's dragons from the verge of extinction before the delicate balance of its wildlife was permanently thrown out of whack.Her momentous mission lead her to a dangerous Dragon World hidden amongst the Moons of Ida, across a perilous landscape filled with wonder and danger, in search of the fabled Currant, a very rare red berry that might hold the secret she sought. Along the way she acquired a fellowship of companions, including the brave and beautiful Becka Dragongirl, a pair of pocket dragons named Drew and Drusie, a charming young child called Ciriana whose destiny was somehow entwined with hers, and Sherlock, a sweet but homely man from Mundania who might just be a master magician himself.Together they gradually began to unravel the momentous mystery of Xanth's missing history. And Clio began to realize that Sherlock's enchantments had begun to work their way into her heart.